Wanna Be "In The Know"? Well hello there, friends! Now, don’t act so surprised… I know it’s been a while, but you didn’t give up on me, right?? To what do we owe the honor, you ask? Two words: balsamic. vinaigrette. I don’t know why, but I am absolutely addicted to the stuff lately! How addicted? Well, those of you who know me can attest to the fact that I LOVE french fries. Like “could eat them for every meal if it wouldn’t give me a heart condition” love. At this point in time, if you put a plate of french fries and a salad covered in balsamic vinaigrette in front of me… I’d choose the salad. Say what?! Yes, it’s true. Yesterday, I decided I needed to find the best recipe so I could have restaurant-quality vinaigrette at home whenever I wanted to. I definitely succeeded – this recipe is better than any balsamic vinaigrette I’ve had in a restaurant. I basically mixed two different salads up with ingredients I love. 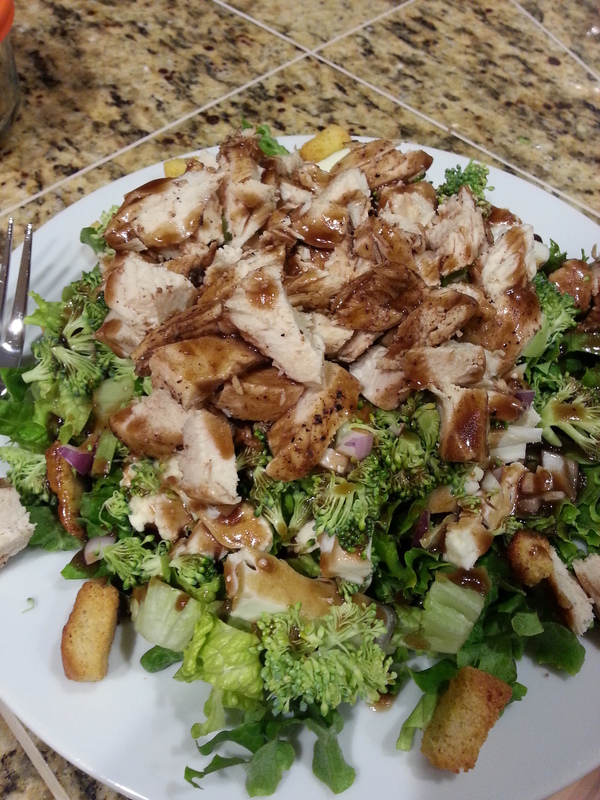 The first night, I was a little lacking in salad fixin’s, so I just used what I had – lettuce, cauliflower, broccoli, red onion, and packaged croutons. Then, I baked a chicken breast in the oven with some of the balsamic vinaigrette and put that on top. Tonight, I made a list and went to the grocery store so I could make a better salad. I ended up buying a rotisserie chicken (cuz they ROCK! ), cucumber, cherry tomatoes, dried cranberries, corn, french bread (for homemade croutons), orange pepper, and lettuce, of course. It was ahhh-mazing! I’m already planning tomorrow night’s salad mixture… I seriously have a problem. 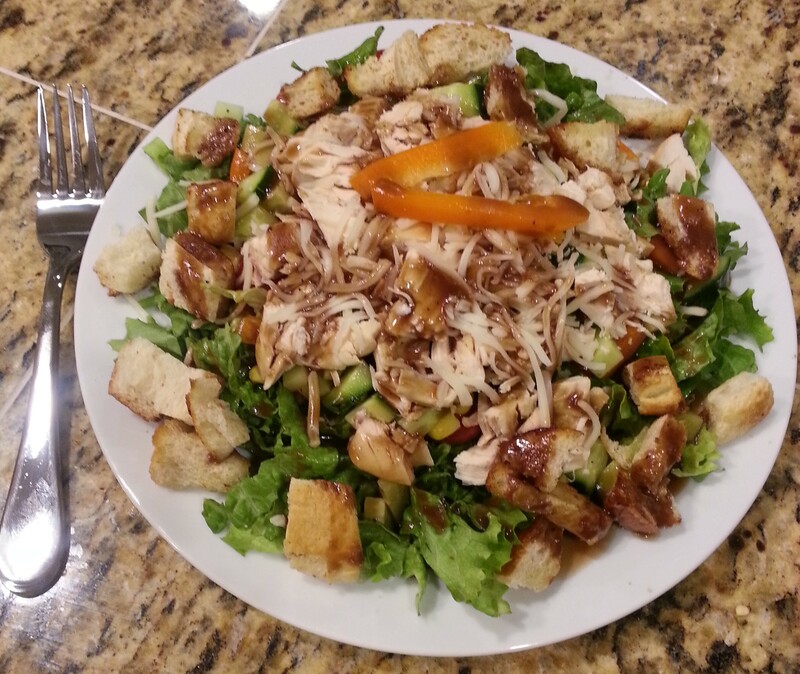 Is there such thing as too much salad or too much balsamic vinaigrette?…..
(For the homemade croutons, cut French bread into 1 inch cubes, heat a frying pan on the stove to medium high heat and add a tablespoon of olive oil and some salt and pepper. When the pan and oil are hot, add the bread and cook for about ten minutes until crunchy, stirring every couple of minutes). I found this salad recipe in taste of home cook books. You take fresh mozerlla cheese & slice it (Costco carries it & it now comes per-sliced) alternate a slice of cheese a fresh basil leaf & tomatoe slice & drizzle balsamic vinaigrette over it & enjoy. I prefer to use fresh spinach in stead of basil. It’s easier to find year round. Hope you enjoy. Thanks auntie! That’s one of my favorites – it’s called a caprese salad. I definitely prefer it with balsamic vinaigrette instead of straight vinegar like some places do it. I had one a couple weeks ago with balsamic vinaigrette AND pesto – two of my most favorite things! Thanks. Never thought about having it with pesto. Sounds good. I have a sun dried tomatoe pesto which should be good.